‘The best thing about fashion is the freedom to be’, says Albert Elbaz – creative director of Lanvin. 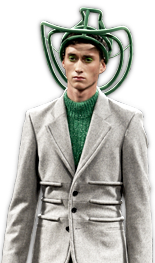 And from this point of view the Lanvin-man can wear anything he wants, from sleeveless jackets, to shirts with a tine bow on a neckline or at the waist, kimono-cut shirts, high waisted khakis, puff sleeves or silk shorts. Lucas Ossendrijver did a wonderful job here, to mix the glamourous with the more adventurous.